iKlip Xpand is a new microphone stand mount for tablets. Its expandable design fits the iPad (from mini to Air, all generations), Samsung Tab, Galaxy Nexus, Kindle Fire and most other 7 to 12.1 tablets. IK pioneered iPad mic stand mounting with the original iKlip, and now iKlip Xpand provides this functionality to millions of other tablet users, giving them a future-proof solution that accommodates a massive range of tablets from dozens of manufacturers. With iKlip Xpand, musicians and performers alike can bring their favorite apps on stage, so its perfect for lyrics, sheet music, karaoke, effects processors for guitar or vocals, virtual instruments and synths, DJ and other groove-making apps. The expandable arms allow for the quick and easy installation of a tablet into iKlip Xpand, even with a case, and its ball-joint design lets you easily adjust the viewing angle, rotate freely between portrait and landscape orientation. It fits poles up to 1.2 (30.5 mm) in diameter, and keeps all buttons and ports freely accessible. 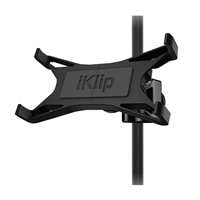 iKlip Xpand is designed and made in Italy from rugged thermoplastic for years of solid performance. Most Tablets from 7" to 12"